Spinballs delivers untimed match-3 fun packed into an unique game concept challenging both puzzle and action game fans. Moving away from traditional colored blocks or gems Spinballs requires players to think different. Colored orbs on seven discs need to be connected by rotating those discs and building up same-color chains. Since time is running players need to act quick and smart. Clearing chains reward them with points, extra time and energy for the four power ups that can be triggered to unleash effects like points multipliers, time slowdowns, automatic orb sorting and full playground explosions. 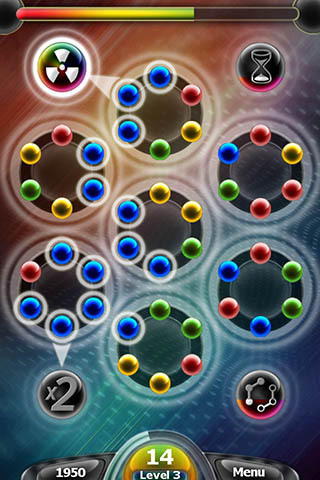 The new Zen-Mode offers a relaxing endless mode enabling players to explore all the features of Spinballs without being stressed by time pressure. And the new special recharger comes handy on charging power ups faster than before. I moved your thread over to our Games Spotlight forum. This forum is just for developers so you guys can show off your hard work. Thanks for posting your game on the WPC looks like a fun game think I'll give it a whirl. Thanks for moving the thread :-).